Let us start off by removing any suspense about what we think of this new coffee maker -- we absolutely love the Tirra by Trudeau. And "Yes", this review has been up for some time (deservedly). We received a randomly selected unit at no cost (however we do not sell this product, and did not receive compensation of ANY kind for the review), which was packaged very well, and comes with a measuring spoon, directions, and even a mini-CD on its use. The satin metal finish and stylish overall appearance should appeal to almost anyone, and would look great with any decor at home or in the best restaurant. The Tirra's fit and finish are excellent. And at first glance, the quality of the materials appears to be very good. All components are listed as "dishwasher safe", although we have only hand cleaned the unit to date. But what makes this little 32 oz. (1 L) beauty "a true innovation"? After all isn't it just another French Press (also called a press pot or plunger) coffee maker? No! Far from it. OK, now just a little suspense, because before we tell you why it is different, lets quickly review what a French Press is. A fairly simple device, a French Press is usually a glass container in which you place a somewhat coarse ground coffee into the bottom, then pour in hot water. In four to five minutes (depending on taste), you press down on a plunger that has a fine mesh screen. This keeps the grounds at the bottom of the pot, and you are ready to pour and enjoy. Many coffee lovers prefer the French Press method because it produces a very rich cup of coffee. This method retains the flavorful bean's oils that are filtered out by drip makers. In addition, it gives you the most control in the brewing process, and allows you to brew coffee at high enough temperatures (many drip makers fail here). However, French Press coffee makers have three major drawbacks: 1) Because grinds remain in the bottom of the press, they continue to brew as long as coffee remains, causing a bitterness from what is called "over extraction"; 2) They are a mess to clean, and the process contributes to breakage of the glass; and 3) There is a considerable amount of coffee sediment that ends up in your cup using this brewing process. The Tirra coffee maker is actually a French Pull, as Ground coffee is placed on top of the cup-shaped plunger, which you start in the bottom of the pot. Hot water is poured over the grinds, which are pulled out when finished. And once you get the hang of using this "pull" style coffee maker, it addresses all three of the major drawbacks of traditional French Presses. Since grinds are pulled, and then locked in the cap, there is no problem of over extraction, and clean up is a breeze. We also noticed a pronounced reduction in the amount of coffee sediment, probably because you are not pouring coffee with all the grinds pressed in the bottom of the pot. We did two tests. We used hot water from the tap of a commercial brewer, which entered the Tirra at 192?? ?Â° F, and after a brew time of just under 5 minutes, serving temperature was an almost perfect 175?? ?Â° F. After getting the grind coarseness right on our second try, we enjoyed a truly incredible cup of rich coffee. The second test was conducted using boiling water, as you would likely prepare your coffee at home. Water was poured in the Tirra at just under 212?? ?Â° F, and after the same brew time, serving temperature was 190?? ?Â° F. Again, great results. After brewing the coffee, since glass loses heat rather quickly, we suggest pouring any extra coffee in a thermal container. The 32 oz. (1 L) and 16 oz. 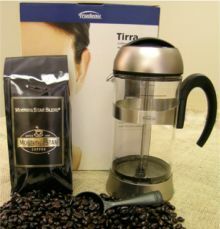 (.5 L) Sadly, we believe this Tirra coffee maker is discontinued. The review remains in hopes it will return. It had suggested retail prices of $29.99 and $24.99 respectively. By Trudeau Corporation, Montreal, Qc, Canada; US offices in Chicago, IL, 800-878-3328. Wondering how much coffee to buy or how long it will last? 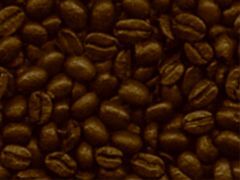 Click here to download our free Coffee Calculator???? now.